At the global level, last year’s $107-billion merger between Anheuser Busch InBev (ABI) and SABMiller altered the beer landscape dramatically. For other international players in the beer industry, this merger has implications in almost every market. But it’s not clear whether these companies need to revise their approach to selling their products in the U.S. market. The U.S. Department of Justice gave the merger the nod in June, but with conditions. Given that the two beer companies involved were already the biggest in the world before the deal, there were concerns about a too-large a share of the U.S. market consolidating under one mega-company. 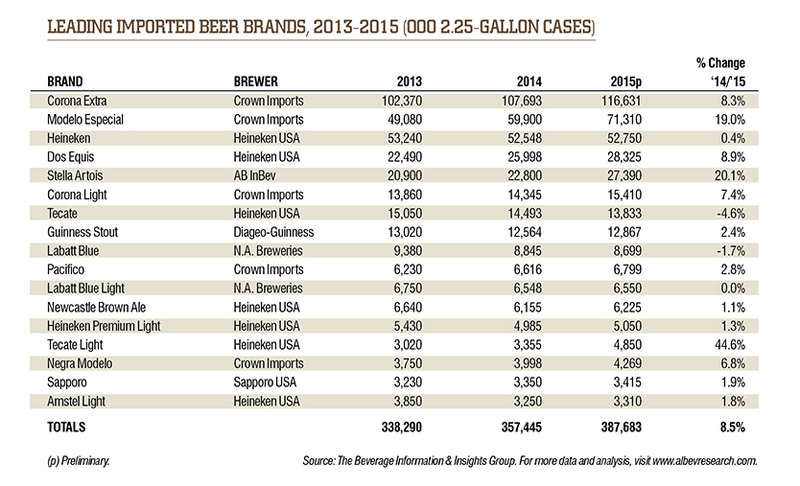 Importers are faced with a U.S. market that is divided broadly into two unequal parts: the traditional, mainstream domestic lager market that, despite flat sales, still represents huge volume; and the specialty and premium market—exemplified by craft beer brands—that continues to experience robust growth, despite its much smaller market share. 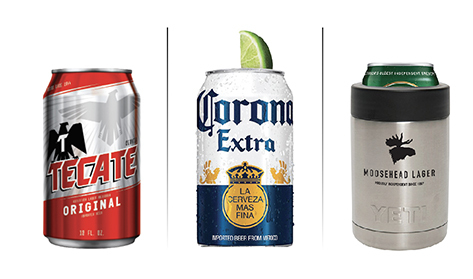 Constellation is the largest importing company in the country, with a portfolio led by the two top-selling brands, Corona Extra and Modelo Especial (all sales data from the Beverage Information & Insights Group). But Hetternich, head of the company’s beer division, could have been speaking for any executive in a major beer company surveying changes in the U.S. market when he explains his company’s approach. Imported beers have long enjoyed a kind of prestige with customers simply because of their foreign origin. Hetternich’s observations underscore the ability of importers to ally their brands with the specialty/premium side of the beer aisle, although the most successful imported brands are brewed in the same basic beer style categories as the major domestic brands. In fact, eight out of the ten top-selling brands are pale lagers (five of these from Mexico), and one is a light lager. All but two of these lager brands experienced positive growth last year, topped by number-two ranked Modelo Especial growing 19% in volume sales and Stella Artois growing 20.1%—figures domestic producers can only dream of. This “premiumization” trend, Hetternich believes, affects at all tiers: from the 4,000-plus companies producing beer to the distributors who have to manage this growing list of choices. “And it causes confusion for consumers at retail, who are finding it increasingly difficult to shop amidst such a broad selection of products and brands,” he says. He challenges distributors and retailers to “lean in” to the changes in the industry. “There is a desire among retailers for actionable insights based on high-end trends, consumer preferences and shopping behaviors, and shelf standards that provide guidance related to assortment, flow and selection of high-end products that can maximize returns on the space investment within their stores. And there is an opportunity for distributors to adapt their strategies, resources and service levels to better align activities with brands that are driving growth and profit for their businesses and at retail,” he adds. Heineken, once the number one-selling import, has long differentiated itself from domestic lagers on the basis of perceived higher quality and sophistication: its “high-end” position. In recent years, the brand—now number three among imports—has struggled to translate that cachet into growth, which sits at just 0.4%. A campaign featuring Benicio Del Toro, titled “There’s More Behind the Stars” will be extended into its second year. At retail, a new sponsorship of soccer’s International Champion Cup, “Soccer Is Here,” will engage customers with merchandising tools and a text-to-win offer for soccer gear and gift cards. Given the proliferation of craft and specialty brands, brewers of all sizes look at the rumored saturation of the marketplace and wonder how to stand out. Although all importers expressed optimism about the ability of their brands to appeal to craft and specialty beer fans, some styles fit more comfortably than others into a craft framework. For decades, Guinness Stout was the only easily available alternative to lager styles. As the eighth best-selling imported beer, with 2.4% growth, it is still a popular choice, whether with specialty drinkers or with a traditional Irish bar audience. Beyond its classic stout, Guinness is offering Rye Pale Ale on a limited basis in the U.S., as well as a second edition of the limited-time variety pack called The Brewers Project Pack. It features Rye Pale Ale, along with Milk Stout and Golden Ale-the first time the latter two have been sold in the US. Although quantities are limited, the Brewers Project Pack sounds like a likely vehicle for introducing craft-styled beers to the American market. US Beverage also makes a claim to appeal to the craft drinker. United States Beverage distributes beers from Scotland’s Innis and Gunn, best known for innovative aging of ales of various kinds in and on different woods. In time for Saint Patrick’s Day, the brewery will offer Irish Whiskey Stout, aged over oak and infused with Irish whiskey. Innis and Gunn recently purchased a smaller Scottish brewery, and expanded capacity will allow experimentation with new products. In 2017, two limited-edition beers will launch in the US. The first, Latitude & Longitude, emerges from the company’s Arctic Beer Project, inspired by Allsopp’s Arctic Ale, brewed in 1875 for an expedition to the North Pole. The brewery owns three bottles of this rare beer, and is using this “oldest beer in the world” as a reference for the new brew. Later in 2017, the brewery will distribute Bold & Brave, an imperial stout aged in bourbon casks. Heineken USA credits the craft and specialty niche for opening new possibilities for imported brands. Constellation blurred the distinction between international brewing companies, importers and craft producers with its purchase of California’s Ballast Point Brewing Company. One of the fastest growing American craft breweries, Ballast Point now joins the score of small U.S. breweries that have sold to large brewing conglomerates, this time to a major importer rather than a domestic brewer. Heineken USA has taken a potentially high-risk decision to refresh the highly successful “Most Interesting Man” campaign, credited with fueling the ten-year sales growth of Dos Equis, most recently at 8.9%. Jonathan Goldsmith, the urbane character at the heart of the campaign, was irreversibly retired in a story line that showed him departing for a life on Mars. Looking north, Moosehead (Canada’s oldest independent brewery and the second largest independent in North America behind Yuengling), will celebrate a double 150th anniversary in 2017: for the brewery and the nation. At retail, look for special anniversary labels, as well as a consumer sweepstakes to win Moosehead Yeti koozies, found in specially-marked twelve-packs of Moosehead cans. Clean, binary distinctions in the beer world seem less and less useful. The domestic-versus-imports distinction is unhelpful when formerly American breweries are global in ownership and scope, and American heritage brands are faithfully brewed overseas. American craft brewers are opening secondary facilities in other countries: are they international, or foreign, now, too? Mainstream-versus-craft arguments get fuzzy when big brewing companies purchase small craft companies and also brew beers in accepted craft-like styles, and craft brewers eye global markets. Julie Johnson was for many years the co-owner and editor of All About Beer Magazine. She has been writing about craft beer for over twenty years. She lives in North Carolina, where she was instrumental in the Pop the Cap campaign that modernized the state’s beer laws.